Written by Felipe Azenha & filed in Community, Events, Quality of Life. 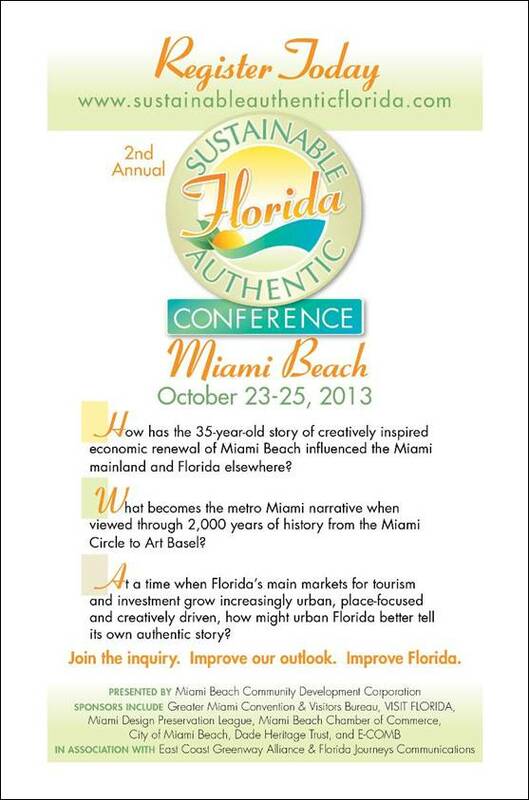 Attend the Sustainable Authentic Conference, October 23-25, 2013 in Miami Beach. The conference will bring together leaders from Greater Miami and throughout Florida to examine the work in preservation/conservation, arts and culture, green building/sustainability practices, economic development and quality of life. · How has the 35-year-old story of creatively inspired economic renewal of Miami Beach influenced the Mia mi mainland and elsewhere in Florida? · What becomes the metro Miami narrative when viewed through 2,000 years of history from the Miami Circle to Art Basel? · At a time when Florida’s main markets for tourism and investment grow increasingly urban, place-focused and creative driven, how might urban Florida better tell its own authentic story?